Welcome to the court of Harun al-Rashid, the greatest Caliph of all time! His prosperous reign was the focus of the cultural, scientific and political world of its time. This game allows you to play the role of a faction whose life, trade and intrigues have only one purpose: to grow rich and powerful, and to ensure the favour of the mighty ruler. 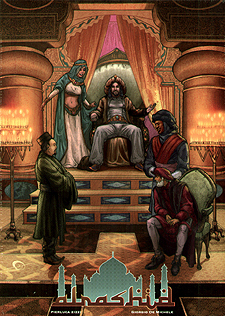 Each player controls a family vying to distinguish themselves in the eyes of the Caliph, dealing with Guilds and claiming important titles in his palace. Al Rashid is a strategy game of trade, intrigue and power play for 2-5 players.